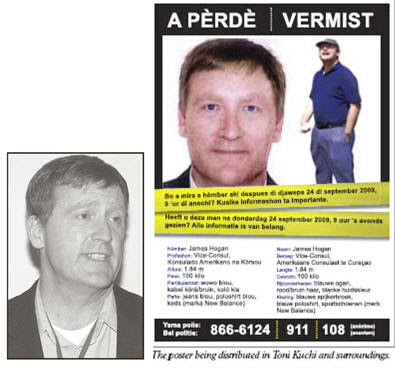 The Bonaire Reporter posted online a poster distributed in the Toni Kuchi area (see above) as well as a photo of Mr. Hogan that appears to be taken from an ESTA briefing in 2008. 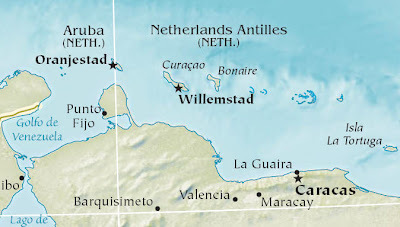 It repeats what has been reported earlier that “a large scale investigation on land and in the sea continues with equipment and manpower from Curaçao, the central government, the Netherlands and the US” and points that there had been little coverage given to this incident in the American press. The AP has covered the story here and here. The New York Times carried one of the AP stories yesterday here. MR. KELLY: Yeah. I think we were all concerned to see the press release of the authorities there regarding the clothes and cell phone that were found belonging to Mr. Hogan. I think you probably saw the press release from the Netherlands forensic service which confirmed that the blood traces found on the clothes were a DNA match for our colleague, Mr. Hogan. These clothes were found on the beach. And of course, we’re – as we always have been, we’re very concerned about the welfare of Mr. Hogan. This is obviously upsetting news. It’s not conclusive news. But we will continue to stay in close touch with the Netherlands forensic service and with the Curacao police. Update on 10/4: October 3 AP update on this story is here (Filed at 3:53 p.m. ET).